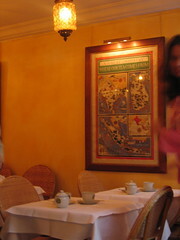 Tea and colonial memory at Mariage Freres. The tea room is set up to look vaguely “tropical” and waiters bustle around in starched white jackets and aprons like butlers. The room is adorned with posters boasting the 1931 colonial exposition that was held in Paris and the poster in the photo says “Where our tea comes from.” How do we construct luxury along with the idea of racial or ethnic or cultural superiority? How is the memory of good old fashioned empire revived to make for a special or relaxing afternoon tea experience? Of course the tea was good, but I thought about Stuart Hall discussing how colonialism can be found in the classic english cuppa- that is, it is worked into our very ideas of the mundane as well as the deluxe.